Twitter is quite a social media juggernaut as of late. It’s getting to the point that one has to have a Twitter account. And what good is a Twitter account without a link to it? 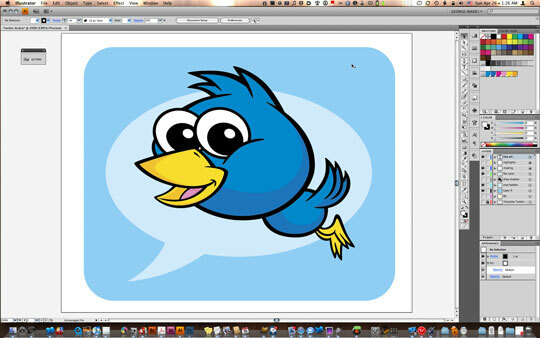 And what better way to link to your Twitter account than with a cool blue bird character illustration? This tutorial will walk you through the steps from sketch to vector in creating an original cartoon-style character vector illustration. 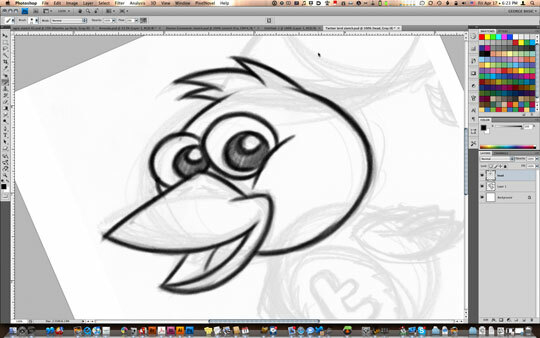 The initial step is to scan your rough sketch in to Photoshop (or your favorite pixel editing software). 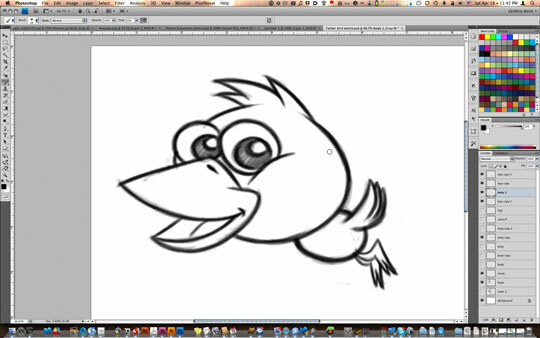 I am using OS X’s Image Capture here, as the drivers for my scanner don’t play nice with Photoshop CS4. Typically I scan at 200 or 240 DPI. This gives me plenty of resolution to work on refining the sketch in Photoshop without having the file size being larger than needed for the eventual Illustrator template this sketch will serve as. I scan sketches with the B/W (grayscale) setting as I have no need for the color information, and the “line art” setting will not pick up the nuances of your pencil sketch. Note that I sketch very roughly in pencil on paper — below I will explain my sketching process in Photoshop, which allows for much more flexibility when refining the drawing. My full sketch process is 25% pencil, 75% Photoshop. Now that the sketch is in Photoshop, I will run a custom “sketch prep” Photoshop action (which you can download at my blog here). This Photoshop action will reset your color swatches back to the default black/white foreground/background colors, do a “Select All” on your image, then copy to a new layer via the Cut feature (which gives you a nice white background layer) and then reduces the rough sketch layer to 20% opacity. Finally, a new blank layer is created for you to start working on the sketch revisions. I like to work on transparent layers when working on sketches in Photoshop so parts of the sketch can be easily copied, pasted, or cut without having to worry about the background white. I do however like to have the white background behind all the transparent layers so everything appears normal when sketching. The result of running the “sketch prep” action. 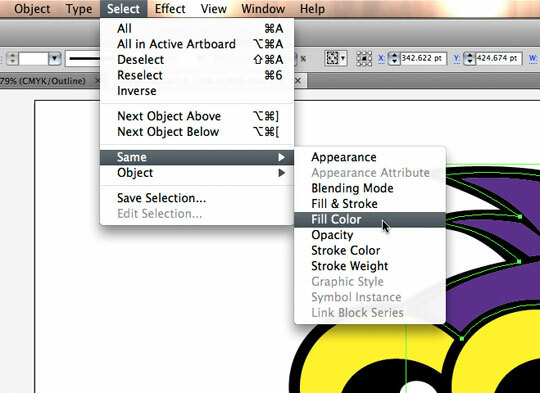 Note the new layers in the Layers palette. 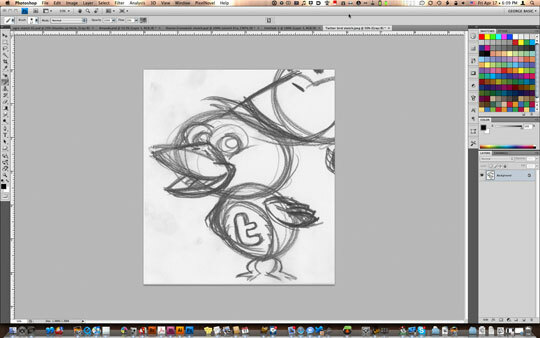 Next I start working on refining my rough sketch on the new blank layer. I do all my sketching in Photoshop using a Wacom Intuos4 graphics tablet. I highly recommend investing in a professional-quality graphics tablet if you are doing graphics work on your computer. You’ll also note in this screen shot that I have used the Free Rotate feature in Photoshop CS4, which allows you to freely rotate the canvas on the fly while you are working with a document. This makes it very easy to get the right angle while you are working on your drawing. I always work by using a separate layer for any distinctive part of a drawing, even with a single character. This allows me to resize, distort and reposition elements of the character in Photoshop to get the right proportions and design down. This is why I do not spend much time with paper on pencil; what I do on paper is just enough to get the basic idea worked out. 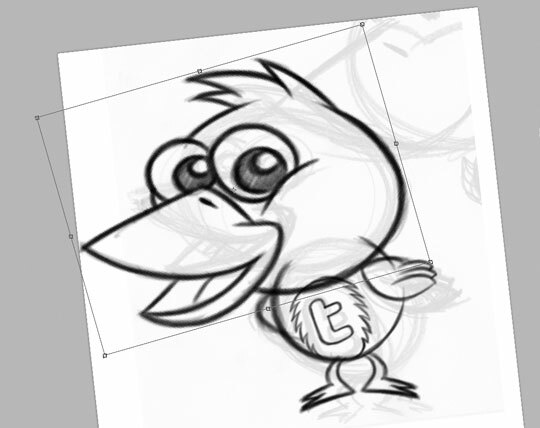 Here you can see that I sketched the body of the bird, but decided I didn’t like the head-to-body proportions. Because the body sketch was created on a separate layer, I only need to hit Command-T to enable Free Transform, which allows me to rotate and scale the layer, as well as skew the layer (which I am doing in the screenshot) by holding the Command key while clicking on a control handle while in Free Transform mode. Again, I use Free Transform mode on the head layer to rotate and move down the head closer to the body. Here we have an entire new body, and an entire new approach to the character. I decided as I was working on this that I wasn’t keen on having the character standing, as I didn’t like how the wings were looking just flat at his sides. 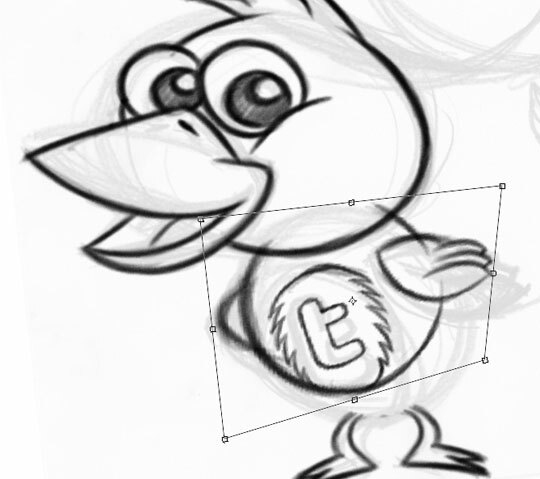 Sketching directly into Photoshop using the Wacom graphics tablet, I quickly worked up a new body, wings and feet. You can see here how much I utilize as many features of Photoshop as I can when working on my sketches. While all of this could be done without graphics software, I like to put my tools to work for me. 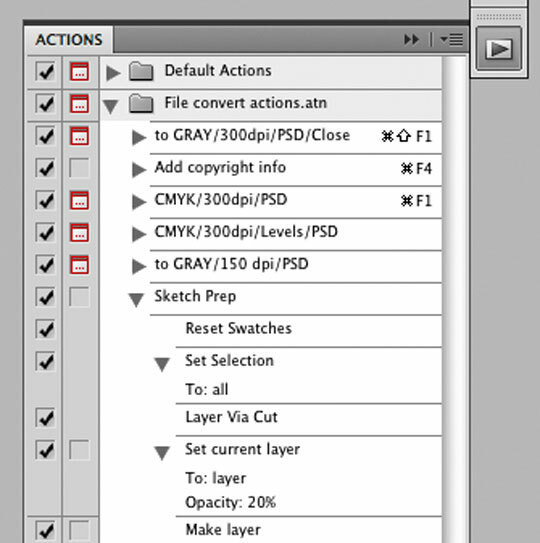 Here I am grouping all the layers of the sketch so far into a Layer Group folder, for easy management. I want to keep the layers separate, but also don’t need them to all be instantly accessible in the Layers palette. 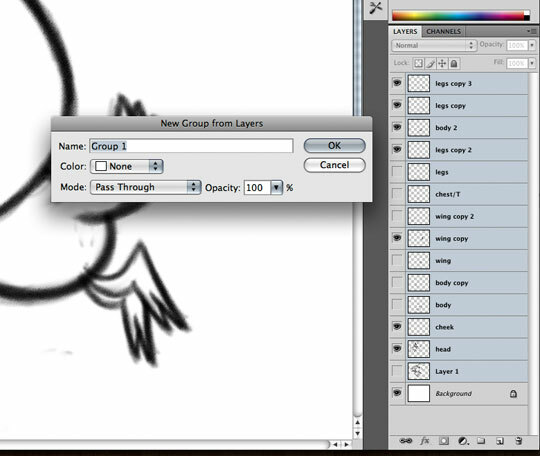 Grouping the layers also allows me to reduce the opacity or apply other layer effects to all the layers within the Layer Group as a whole. Note how many layers I am using, even for this fairly simple character. By keeping all the elements on separate layers,and working on copies of layers, I never have to waste time to go back and re-draw anything. Better safe than sorry. RAM is cheap and if I want I can flatten or delete all the layers once I have my finished sketch. Here I create a new empty layer outside the previously grouped layer folder, to work on refining the line work in preparation for the vector art stage. The final cleaned up line art. This artwork will be used as a template in Illustrator when creating the vector art. Now we move over to Adobe Illustrator. Here you see the new document dialog box, and I have some custom starting documents that are set up the way I like to work — CMYK mode with the units of measurement set to “points”. Points work best for me as far as increasing strokes and nudging objects. 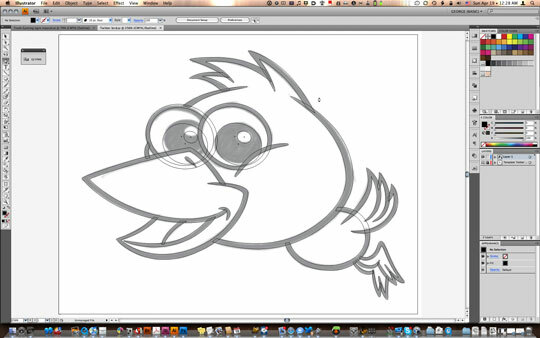 Next, the Photoshop sketch will be placed into Illustrator as a template for use as a, well, template. 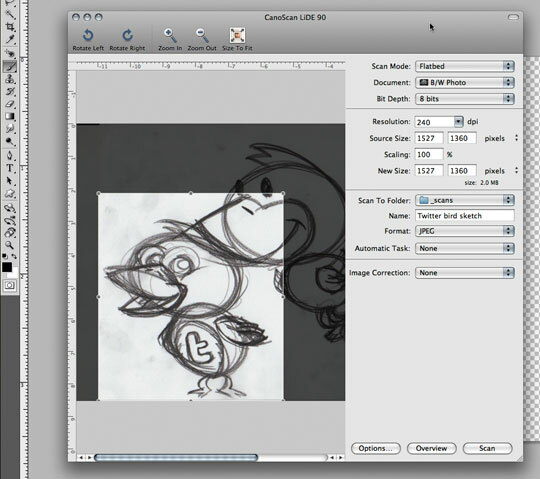 The sketch created in Photoshop will be placed and used to trace the vector paths in Illustrator. Go to the File menu, and scroll down to the “Place…” command. 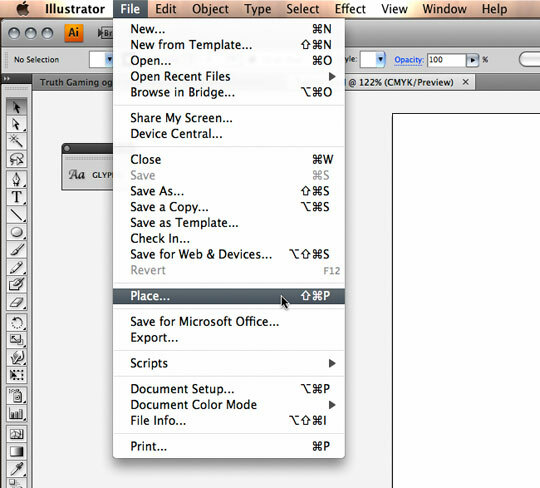 Navigate to the folder where your sketch is saved. Be sure the check the “Template” checkbox. This will place your Placed Image on a new layer, dim it to 50% opacity and lock the layer for you, all automatically. The dark bezel you see around the dialog box is the OS X file and navigation utility Default Folder (highly recommended). Next, switch to Outline Mode. Outline Mode is like a wireframe mode, where your vector paths will only show up as lines, and no color fills or strokes will appear. 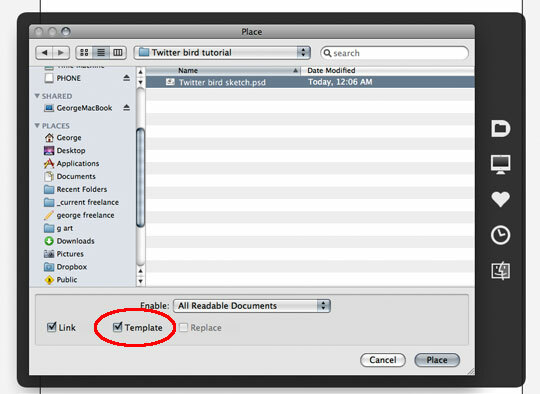 This helps in being able to see your sketch template as you work. Since we worked on the sketch at 200 dpi, we have plenty of resolution to zoom in on the details to create our vector art. 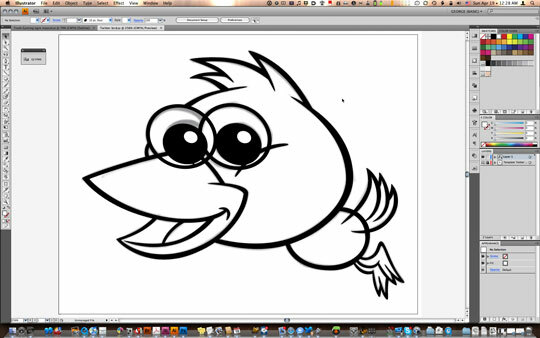 You can see here that the final line art sketch was created with the vector art in mind. Nothing was left to the imagination at the final line art sketch stage, so when the vectors are created you do not have to figure out what needs created. At this stage it’s mostly a matter of tracing the outlines. I use the Pen tool 99% of the time when working on the line art, and I create all my vector art by hand-no Live Trace is used. Not only does creating the vector art by hand allow you to keep the number of anchor points to the minimum, by doing so it also keeps the lines nice and fluid, allowing curves to flow and blend into each other. This results in a much sleeker final illustration. You’ll also notice that I do not use the Calligraphic Brush tools. In essence I actually trace the line art as if they were shapes. Primarily this is done to give me much more control of the tapering thickness of the line art, which I just cannot achieve using a uniform tapered calligraphic brush (believe me, I have tried). Here is a nice time-saver: if you look closely in the screenshots, you’ll notice I am not dragging out the arcs in the curved areas as I encounter them along the line, but rather adding a central point to the line after the fact. The key here is that each “corner” is actually a small curve. By making these corners small curves, when I go back and add a central point between two “corners”, that anchor point had control points added and is technically a very, very wide curve. By switching temporarily to the Direct Selection tool by holding down the Command key (note that the Direct Selection tool must be the last selection tool used before you switch to the Pen tool for this to work), I can then quickly reposition the newly-added anchor point and snug it up to the arc/curve in the line art template sketch. This technique is much easier than dragging it out while you create and trying to approximate the proper length the control handles should be. This technique is much easier to see than to explain, so I have put together a quick video demonstrating how it’s done. Here, most of the line art vectors have been created. Notice the eyes were created as full circles, as was the bulk of the body. It’s much easier to get a consistent, flowing line by creating even the obscured areas, and then erasing those obscured areas later. Now switch over to preview mode, so you can see how the artwork is looking with the filled in areas. All the overlapping, obscured line work is more obvious here. At this stage it’s probably a good idea to save a copy of the line art layer for backup, in case you need these full shapes later on. 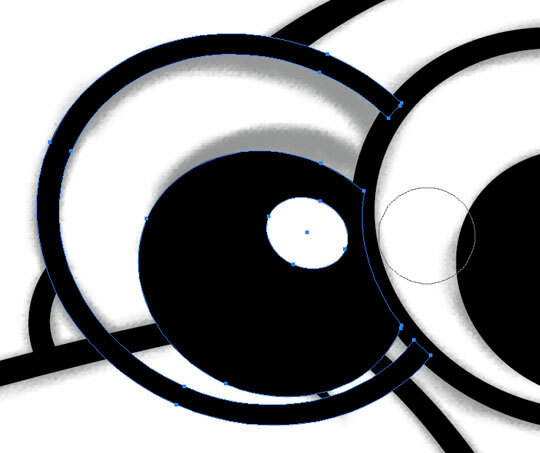 To eliminate the unwanted obscured areas of the rear eyeball, select all the shapes comprising the rear eyeball (outline, pupil and highlight), then switch to the Eraser tool (Illustrator CS3 & CS4 only). If objects are selected, the Eraser tool will handily only affect (erase) the selected objects. 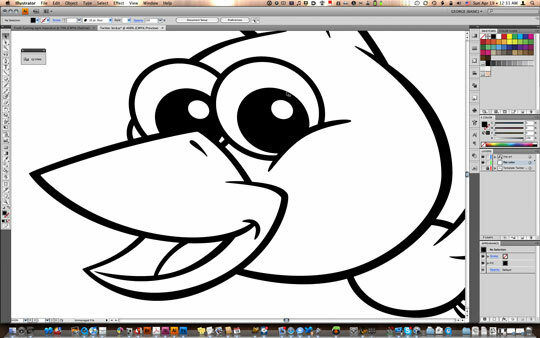 Here the areas of the eye behind the beak were also erased. Continue to do this for all necessary objects. 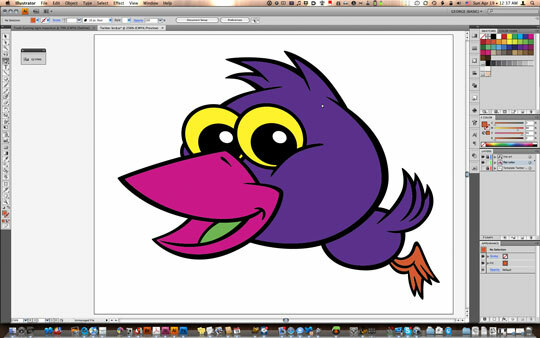 No, we aren’t turning the bird into a flying purple people eater. I never fill in color areas with anything close to the final colors, so I know to choose proper colors and to also make sure all the objects using the same color are using a Global swatch. Using Global swatches allows me to edit the swatch, and have all the colors using that swatch in the artwork updated at once. All the color areas were created on a new layer, underneath the line art layer. This way, the line art sits on top and the color shapes are underneath and on a separate layer. This allows for more flexibility when adding shading later. Another method of creating the flat color shapes is by using Illustrator’s Pathfinder -> Unite feature on a copy of the line art, and then releasing the resulting compound path so you can select each interior shape and recolor as desired. Running the Offset Path feature with 1 or 2 pixels for the offset to add a bit of overlap could also be done to ensure there are no gaps where the filled areas meet the line art. Place this layer below your line art layer. It really depends on the illustration — this alternate method works great in some cases and not so great in other situations depending on the structure of your vector art file. Here I am consolidating all my “bird body” colors by first selecting the purple head shape, and then going to the Select menu, then to the “Same” submenu, and finally selecting “Fill Color”. What I am doing here is selecting one color, then automatically having Illustrator select all the other objects using the same color. 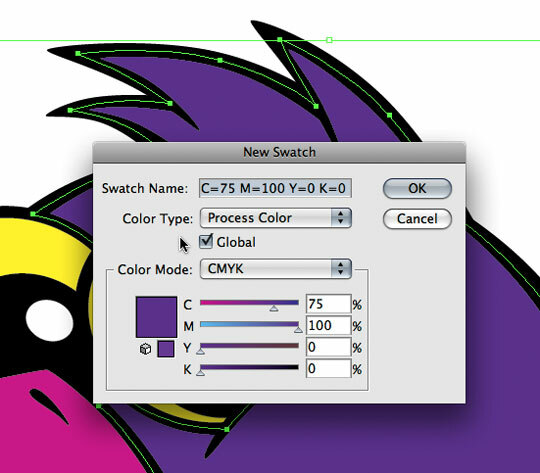 I then go to the Swatches panel and click on the “New Swatch” icon, which opens up the above dialog box. For now I leave the color as-is, but the important thing here is to make sure the “Global” checkbox is selected (it will not be selected by default). Once I have done this for all the colors in the bird, I can then go back and double click on the global swatches in the Swatches panel and tweak the colors to preference. Next step is to add the shading. 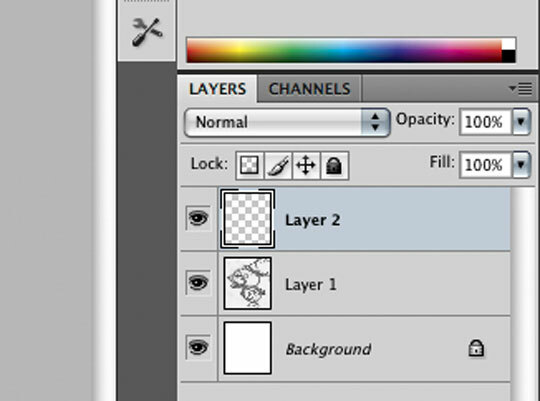 Create a new layer, and then target the layer by clicking the small circle on the right hand side of the layer in the Layers palette. You can tell the layer has been targeted by the outline seen around the circle. By targeting the layer, we can then apply a Blend Mode to the layer, and this blend mode will affect all the objects on the layer. This saves us time from having to set blend modes and opacities for each object on the layer individually. 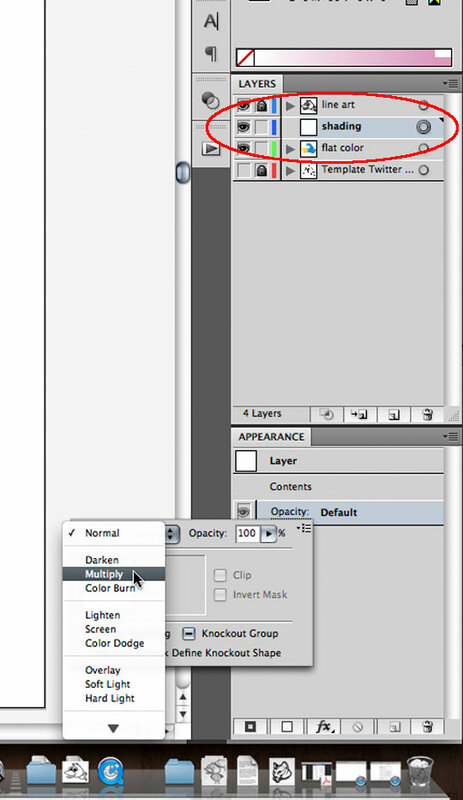 I am setting the Blend mode via the (new to CS4) Appearance palette. For the shading, set the blend mode to Multiply, and then also reduce the opacity to 40%. You’ll notice, if you look back at the Layer target that the circle is now filled in with a dark gray; this indicates a Blend mode has been applied. Now we can just create flat color shapes on this layer, and let the layer effect give us the desired results. Typically the Multiply blend mode will allow you to use the same exact color you used for the flat color as the shading color. Sometimes however you may need to create a new swatch and darken it up with a bit more K (Black). 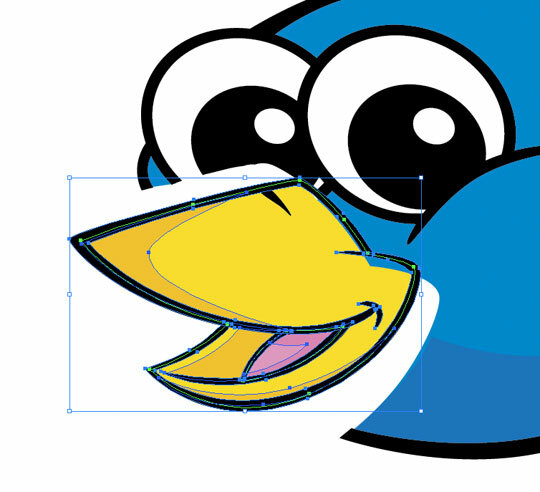 Note: if you are using a version of Illustrator without transparency (versions 8 and lower), you’ll need to just create a flat color for the shading and skip the steps above. Hopefully my thought process behind the separating of the line art and the flat color on separate layers is making more sense now. With the shading layer sandwiched between the two, this allows us to have much more flexibility and also not have to worry as much about precision since the line art layer sits above all the other layers. Continue to add all your desired shading. Now we are going to go back and tweak our line art, which we can see better in the overall final artwork with the color and shading applied. In the screenshot you’ll see that my earlier tip about hand creating your vectors and keeping your anchor points to a minimum comes into play here, making it much easier to grab just a single anchor point and tweak and refine the line art where necessary. Typically the artwork would pretty much be done at this point, however while I was looking at this artwork I realized I did not like the size of the bird’s beak in proportion to his head. 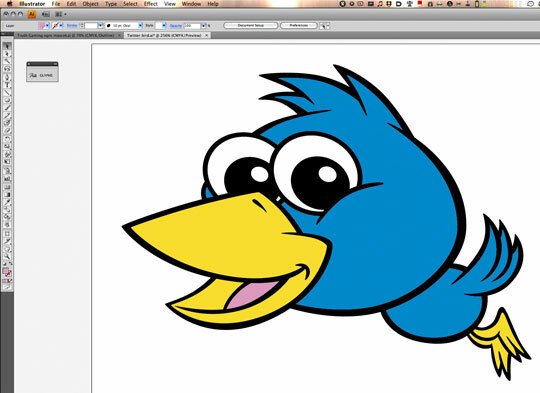 Just as the name “Twitter” has a bit of a “cute” ring to it, and after looking at the color art I realized a smaller beak on the bird would give it a younger, more cute feel. 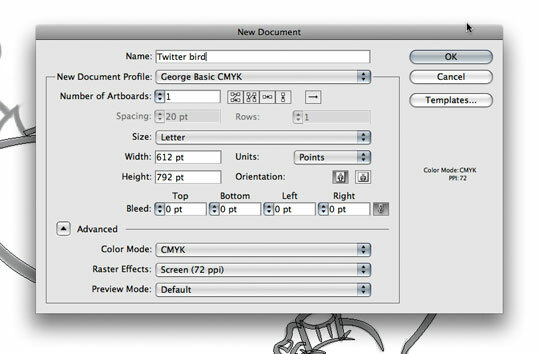 Illustrator CS4 now has a “multiple artboards” feature, which I am going to use here so I can work on a copy of the original art on it’s own artboard within the same document. This is a great example of why I like to create the elements of the artwork as full shapes as opposed to just the visible lines. Making size revisions like this is much easier. Unfortunately, I did not create the artwork this way (or already erased the parts which were full shapes) and I didn’t save a copy of my line art layer as I recommended earlier in this tutorial. I will thus need to go back and edit the line art manually. This is easily done since I hand-created all the vectors in this artwork, as opposed to using the Live Trace feature. 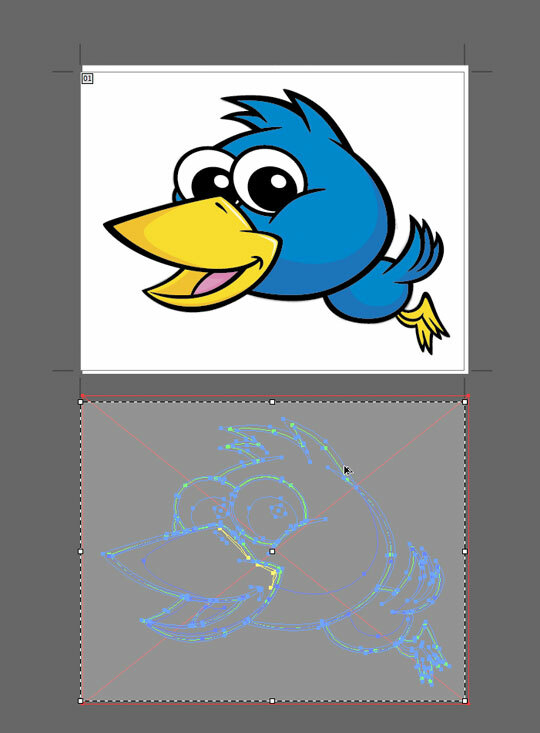 Live Trace ends up creating too may stray vector points, and cleaning up and smoothing out the paths takes more time than just hand-creating your vectors from the start. On a side-note, this is also a good example of being able to step back and look at your artwork objectively, even at the final stages. Ideally, the overall design would be worked out before you reach the vector art stage — but never let that stop you from evaluating your creations and making sure they are achieving the goals they are intended to reach. 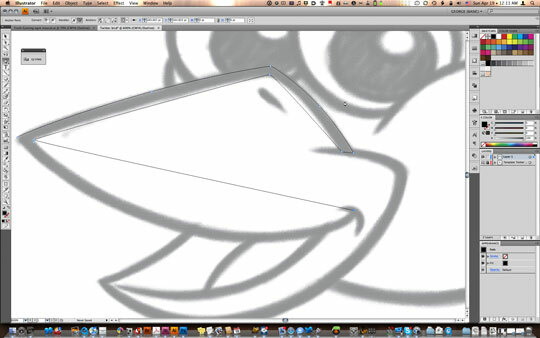 Here I have selected all the vector objects comprising the beak, and resizing them. 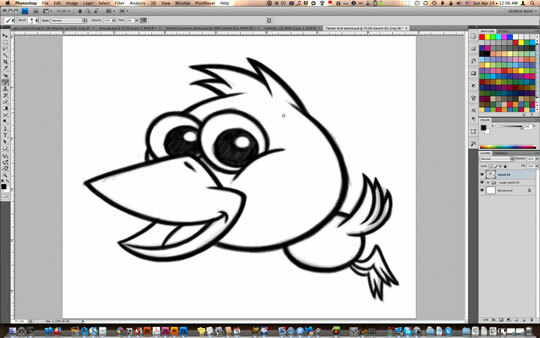 Next, I needed to go back and rework the line art for the head to allow for the resized beak. 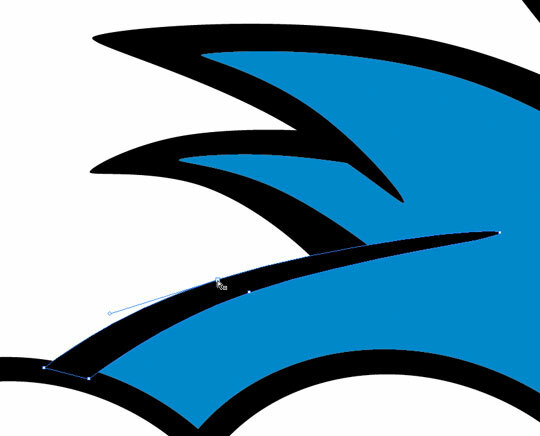 Again, had I created the head shape as a full circle, much of this editing would be unnecessary. The final reworked art. I think you’ll agree the smaller beak is working much better. Since the end use for this project is an icon one can use on their website or blog to indicate a person’s Twitter account link, I wanted the mascot to be enclosed in a rectangular icon, and also to distinguish the bird as a Twitter bird, I added the chat bubble to reflect the conversational nature of Twitter. Voila! The final artwork is complete, and ready for use to tell the world you’re using Twitter. The final artwork is then exported to desired formats for use on the web. 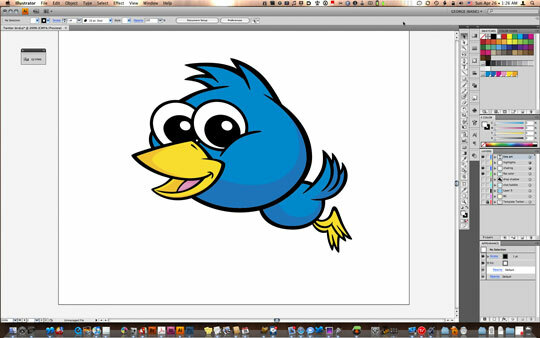 The final Twitter bird artwork files can be downloaded here, and the ZIP archive contains a CS4 version, as well as a CS1 version of the Illustrator file. Also included are three sizes of PNG icons for use wherever you need ’em! Obviously, there are some extra steps in the tutorial above, especially the parts where I reworked the art at the end. Instead of showing the ideal method, I wanted to give a real-world example, warts and all. I believe by showing the errors, it helps explains why the artwork is created as it is — one can see how easily an illustration can be tweaked at the end of the project if need be, by using a smart process from the start. I would also encourage you to not use this tutorial as a “bible” for creating character illustrations, but rather use it as a stepping stone. As with any graphics software programs, there are as many ways to do something as there are users. Hopefully this tutorial gave you one way of approaching the creation of a character, which you can then use to expand and enhance with your own methods and techniques. I look forward to your comments on how this tutorial helped your workflow, as well as any suggestions on how it might be improved. I am always looking for — and open to — new ideas, methods and techniques to improve my workflow and productivity. 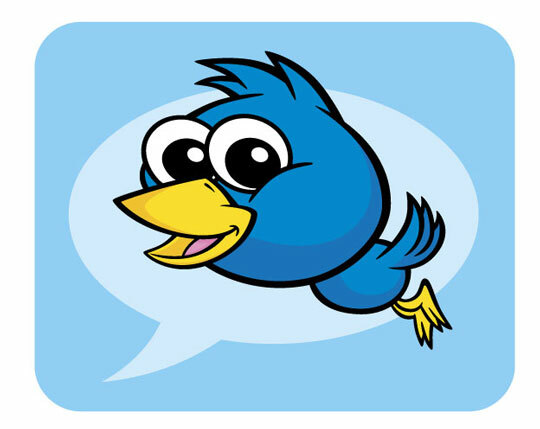 And I suppose this Twitter bird tutorial wouldn’t be complete without my own link so you can connect with me on Twitter. George Coghill is a freelance illustrator specializing in monster, creature and cryptid artwork. 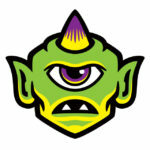 His illustration and monster artist merchandise work can be seen at Monsterologist.com.